Thank Heavens the Mayor's office (thanks to Margaret Hodge) has come to its senses. 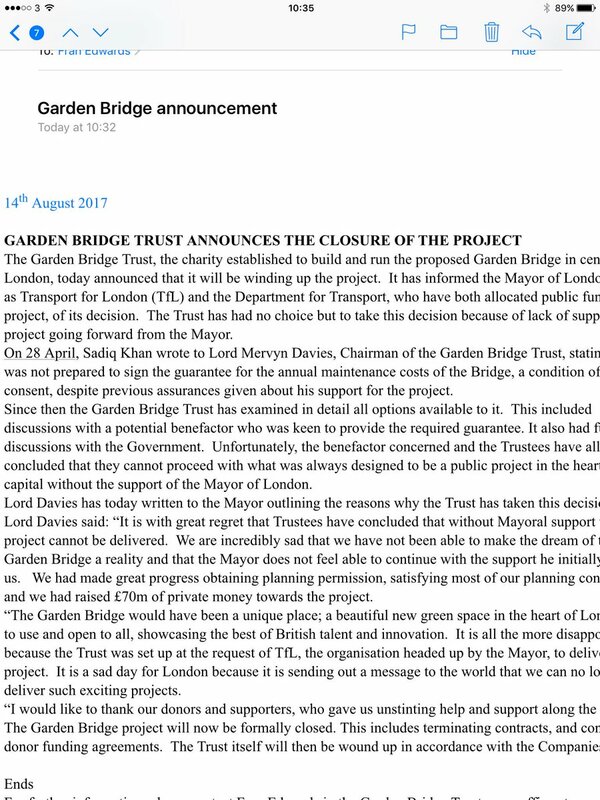 I am all in favour of both private and public works and improving London, but the bridge was always a vanity project and, even if it had been desirable and open to all, the private sector was never going for fund it. It would have been a mill stone of expenditure round the necks of London council tax payers for generations to come. The project should never have been allowed to waste £50m of public funds - the backers should have been required put up or shut up far earlier in the process. Boris Johnson, George Osborn and TfL have much to answer for. I hope the National Audit Office will audit what happened for the public record and as a lesson fir the future. Hurrah! Now all we need to do is get the air headed luvvie to refund the huge amount wasted on her green elephant. I like Joanna Lumley. Had a massive teenage crush on Purdey... You never forget your first love. Me too but I still would not let her run the country or make decisions about public expenditure! Great news. Lumley's vanity project indeed. Very true. But what should worry us is that all the efforts of local and other campaigners, who fought long and hard against the proposal on environmental grounds, loss of public space, disruption of riverside views, 'the wrong bridge in the wrong place' etc, had no effect whatsoever on the decision. Money talks - or in this case 'lack of money says "no"'. Who can doubt that if the Mayor had not turned off the public expenditure tap, we would have be lumbered with a bridge too far, whether 'we' wanted it or not. Campaigners against the expansion of Heathrow should take note. I have to admit that I was always puzzled as to why the proposed bridge had to be in that location and no other. If it really was going to form part of the transport infrastructure (hence TfL's involvement) and bring all round improvement and general wonderfulness to our area, surely another more 'needy' part of the River Thames would do very well as an alternative. Could it possibly be that only such a prominent position could satisfy the numerous egos involved? Surely that can't be the case! Suziq. TFL was involved because the northern landing spot, Temple tube, is the least used Zone 1 station. I am not sure whether that decided the position of the bridge,, but it was certainly a factor.